This postcard is unused (never postmarked). The Worcester Woman's Club Building, completed in 1902 and now known as Tuckerman Hall, is one of the most unique and historically interesting buildings in Worcester. It's triangular shape was essentially dictated by the small parcel of land on which it is built, but the design solution for this limited footprint is both elegant and beautiful. 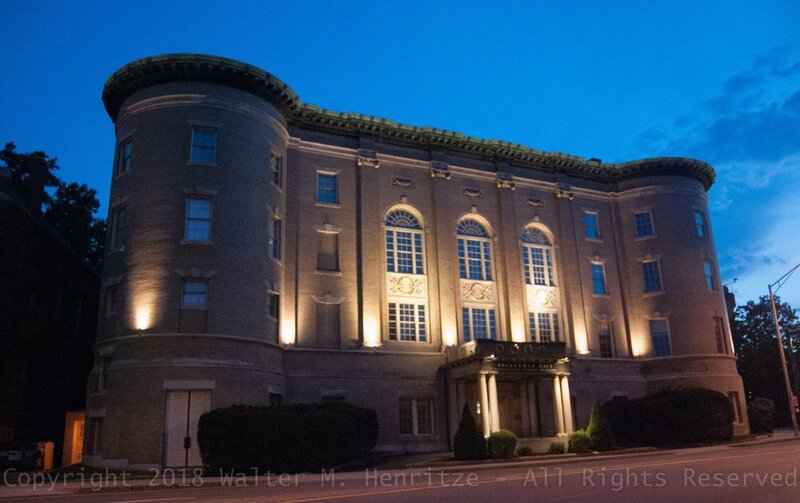 The architect, Josephine Wright Chapman, anchored this Neoclassical Revival building with circular towers on each of the three corners, which allowed a setback of the main facade and provided room for a drive-through portico. To accommodate a sharply sloped building site, the front of the building is four stories tall, while the back is only three stories. The life story of Josephine Wright Chapman is worthy of an entire book and an overview of her history can be found in the references provided below. She was born in 1867 and, despite her family's intense disapproval, convinced a prominent Boston architect (Clarence Blackall) to accept her as an apprentice. Five years later Chapman established her own firm and in 1901 applied to join the American Institute of Architects and the Boston Architectural Club. They both turned her down. Chapman subsequently moved to New York City and in 1907 was accepted as a member by the New York Society of Architects. Tuckerman Hall today is the home of the Massachusetts Symphony Orchestra and hosts dozens of public and private events each year. NOTE: The title on the front of the card says that this is the “Worcester Women’s Club” but the correct wording should have been “Woman’s” (singular possessive). Thanks for Susan Ceccacci for pointing out this minor but important detail. Newer PostBoy's Club - I have no pets now . . . Older PostBancroft Tower - You are not forgotten. Sign up here with your email address to get notified when new blogs are posted. I absolutely DO NOT SHARE any of your contact information. We respect your privacy.